YOUNG KIDS VS DUMB MACHINES. Still not convinced that the U.S. election system is woefully insecure? Chew on this: It took an 11-year-old just 10 minutes to hack a replica of the Florida secretary of state’s website and change its stored election results. The young hacker, Audrey Jones, was one of 39 children between the ages of 8 and 17 to take part in a competition organized by R00tz Asylum, a nonprofit focused on teaching kids white-hat hacking, during annual hacking conference DEFCON. During the one-day R00tz Asylum event, the children set out to infiltrate sites designed to replicate the ones used by 13 battleground states to convey election results to the public (hacking the actual sites would be illegal). All but four of the children succeeded. RIGGING THE SYSTEM. In once case, a young hacker changed the results to note that voters cast 12 billion votes. In other, they declared “Bob Da Builder” the election winner. While these hacks wouldn’t necessarily change the results of an actual election — after all, these are just the sites that convey the results to the public, and the officials would still have the accurate vote counts — it’s not hard to imagine how they could easily influence one. For example, a hacker could convince one candidate’s supporters that their candidate had no chance of winning, thereby discouraging them from hitting the polls later in the day. Conversely, they could convince supporters that their candidate has such an astronomical lead that they don’t actually need any more votes. GOING ANALOG. The news that the U.S.’s electronic voting systems are subpar? Not all that new. We already knew that Russians attempted to compromise the U.S. election system in 2016; in July, we found out that the company responsible for manufacturing the majority of voting machines used in the U.S. sold systems that could connect to the internet, making them vulnerable to hacking. So now that we know that our electronic voting systems are literally so easy to hack that a child could do it. What should we do about it? 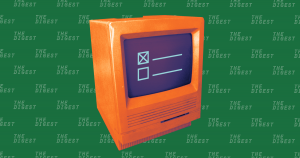 Some have suggested returning to paper ballots, while others think recording votes on a blockchain could fix the U.S.’s election security issues. Whatever the solution, the U.S. is just three months away from an important midterm election, and clearly, something needs to change if it doesn’t want to repeat the same mistakes of the 2016 election.